Husky 50 foot 5 bulb incandescent portable work light. 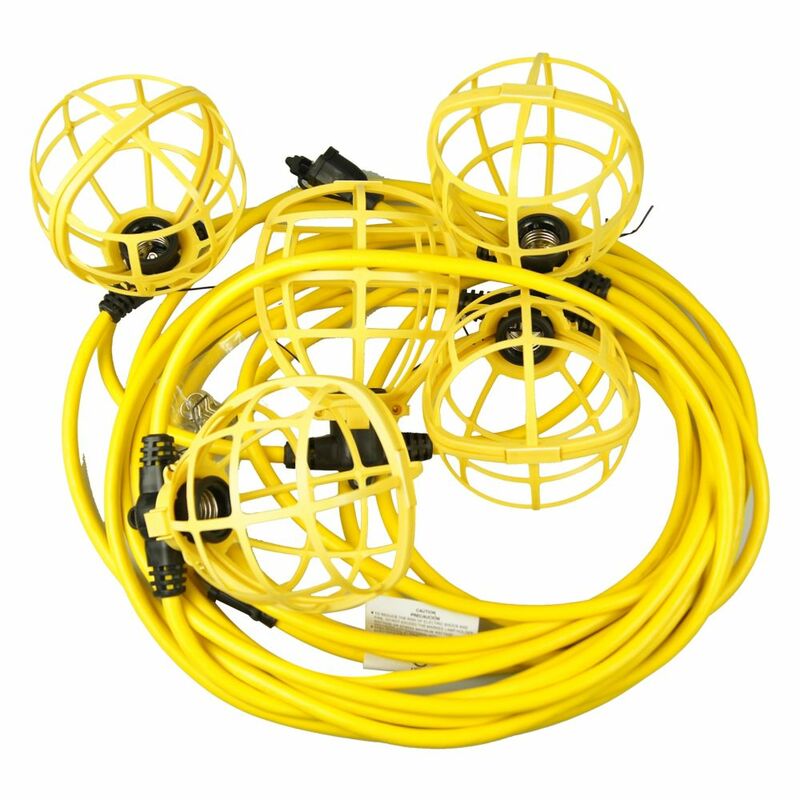 Yellow cord and cage are for high visibility at night and outdoor. Each socket protected by a durable, plastic cage with locking tab attachment. Evenly spaced sockets every 10-feet, accepts bulbs up to 150-watts each. The Halo MST203 outdoor security floodlight incorporates an adjustable motion sensor, field-selectable CCT, and advanced two-stage optics into a twin head LED design ideal for a wide variety of applications. Features improved adjustability, easy install components, and adaptor plate kit for hassle-free installation. The motion sensor is available with 1800 or 2700 detection up to 50' range, with adjustable sensitivity and duration from 1-12 minutes. The durable die-cast aluminum housing is available in bronze or white powder coat finish, ensuring years of reliable, maintenance-free operation. Add style while enhancing the beauty of your home and landscape with this professional-quality 12V 6-Light Cast Aluminum Path Light Kit from Hampton Bay. The UV-protected black paint finish and heat-resistant lenses ensure a long life and are made to withstand outdoor elements. This box includes six path light fixtures, six 4W incandescent wedge base bulbs, a 12-inch SPT-1 18-gauge cable with easy quick-clip connector, 40W transformer with photocell and timer, and a 50 ft. SPT 2W 18-gauge landscape wire. Elegant yet whimsical! Reminiscent of much appreciated Lotus Flower or Lilly pad in bloom this weather-resistant candle holder with built-in resin LED candle will add just the right mood to any occasion. Available in four on-trend color finishes. Make a statement with four or more together or one in each color to set a more eclectic mood. 50 ft. 5-Socket Temporary String Worklight Husky 50 foot 5 bulb incandescent portable work light. Yellow cord and cage are for high visibility at night and outdoor. Each socket protected by a durable, plastic cage with locking tab attachment. 50 ft. 5-Socket Temporary String Worklight is rated 5.0 out of 5 by 1. Rated 5 out of 5 by Dave from Great Lights The lights worked great for the renovations being performed. Easy to assemble.